Dogs and cats who made it through the Camp Fire in Northern California now face a new challenge in San Diego. 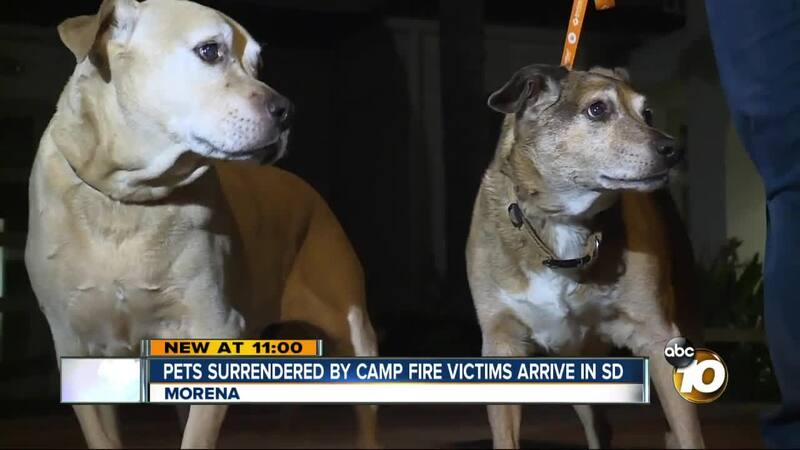 SAN DIEGO (CNS) - Eight dogs and three cats surrendered by their owners after their homes were devastated by the Camp Fire in Butte County are now in San Diego. A San Diego Humane Society team deployed to Northern California for 10 days and rescued the pets, according to spokeswoman Dariel Walker. "We want to make sure they get medically and behaviorally screened," said Jackie Noble, SDHS Kitten Nursery Manager. "They've been through a lot, some of them were actually in the fire and had burns. So, we want to make sure they're healthy and as soon as we have them all cleared, we'll put them up for adoption." Over the 10 days, the San Diego team spent 14 hours a day tending to animals impacted by the blaze. The Camp Fire is the most destructive wildfire in California history. It claimed the lives of 86 people, blackened 153,336 acres, destroyed nearly 14,000 homes, 528 commercial buildings and nearly 4,300 other buildings.